Thoughts are a lot like seeds. You produce countless thoughts every day, just like a tree produces countless seeds. When the seeds of the tree get disbursed, a few of them will land on fertile ground, sprout and grow. However, most of them will not. Most will scatter to places where they will not be able to sprout, or an animal will eat them before they have a chance, and they never become trees. Our thoughts are much the same. The majority of your thoughts don’t go anywhere, they simply come, then go. They don’t do much harm, nor do they create much. Some of our thoughts will sprout initially, but then wither and die before becoming anything more. Then some of your thoughts will take root in fertile soil and grow into a tree. It may be a small birch tree or a giant sequoia. An example of a thought which became a great sequoia is the Wright brothers’ thought that flight was possible. That thought started as a seed in their minds, was fertilized and fed by belief, was given the sunlight of action and persistence, and became the reality of modern aviation. Any book that was ever written, any work of art, any movie, any company, any invention, any scientific theory, any building or monument, began as a seed in someone’s mind. Look around you right now. What do you see? Especially if you are indoors or in a big city, you are seeing the results of someone’s idea, someone’s seed which was tended, sprouted and grew into whatever it is you are looking at. It all began as a thought, nothing more, nothing less. Likewise, failures begin as a seed in someone’s mind as well. What happens to most of us is that we do not pay attention to the seeds that we tend vs. the seeds we cast away. 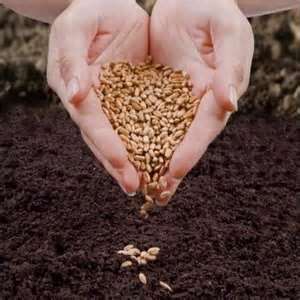 Some of us give much more fertilizer of belief to seeds of doubt, of insecurity, of ill health etc., than to the seeds which would bring us wealth, health and happiness. Somehow, we just don’t believe those good seeds will sprout, so we cast them away. You have a great idea for a business, but cast it out with the thought “oh, but I could never make that work.” We plant and nurture the seed that says “I can’t” instead of the one that says “I can,” without fully realizing that the choice is ours. We make the choice of which thoughts to nurture and which not to. Try this visualization exercise: as you begin the practice of watching your thoughts, when you notice a negative one, turn it into a seed in your mind, then thank it for what it has taught you but tell it very clearly that it will not be planted, and cast it away. You can even blow it up in your mind. I like to blow mine up like a pretty firework and watch the sparkly trails fizzle out. The reason for thanking the seed is to release your resistance to it. Resistance to a persistent thought will only cause that thought to come back again and again. When you thank it, it helps you let go of it. That thought is not there to torment you, it is there to teach you. Thank it for that, then cast it away or blow it up. Also, you can put the seed in a rose and blow up the rose. Roses seem to have a unique power when used in visualization exercises, we will explore more rose visualizations in later posts. If you have trouble with the idea of blowing it up because it seems violent, remember that what you are doing is simply transmuting the energy of that thought. You are not destroying anything, for destruction is impossible since energy cannot be destroyed and thoughts are just a form of energy. What you are doing is taking the energy of that thought and allowing it to be recycled back into the greater good. Once you’ve blown it up, it no longer holds that form which was harmful to you, it has the opportunity to be recreated, reabsorbed into the whole and be reformed as something else. Once you’ve done this, then find the thought seed you want to plant, tell it you believe in it, put it in the soil, give it water and sunlight and watch it grow. If you’ve already planted the seed in previous visualization, you can water the sapling or tree it is becoming. Watch it become bigger and bigger in each visualization. Send it love, remind it that you believe in it. This practice takes time and patience. You may have a lot to clear out. Often, you may not even be sure what you need to clear out, you just have a bad feeling which tells you that your thoughts are not in line with your best interest and with source, since feelings are your best feedback mechanism to let you know when your thoughts or energy is not in line with what you want. In that case, you don’t have to even know what the thought or energies are exactly, you don’t have to name them, just set the intention to rid yourself of the thought, energies and associated feelings that you don’t want and don’t need, then perform the seed and/or rose blowing visualization. Part of what is so wonderful about this is that you are working with the higher intelligence, you are working with the field of consciousness which connects to everything in the universe. This field already knows what you want, need and don’t want and need. You don’t have to be specific, you just have to set your intention toward getting rid of what you don’t want and brining in what you do, even if you are not sure what that is at first. It will become less muddled with time. If you feel stressed, edgy, just not right – then start blowing seeds, start blowing roses. You will feel your energy start to lighten.